Archaeological investigations undertaken in the Scottish Borders by GUARD Archaeology have discovered a lost medieval village dating from between the fourteenth and sixteenth centuries. The discoveries were made during a Scottish Water project to lay a new water pipeline mains on the outskirts of Selkirk. This provided an opportunity for limited archaeological investigations where the course of the pipeline crossed the site of the Battle of Philiphaugh, fought in 1645, and skirted the edge of a Scheduled Monument identified from aerial photographs as a possible early medieval settlement. 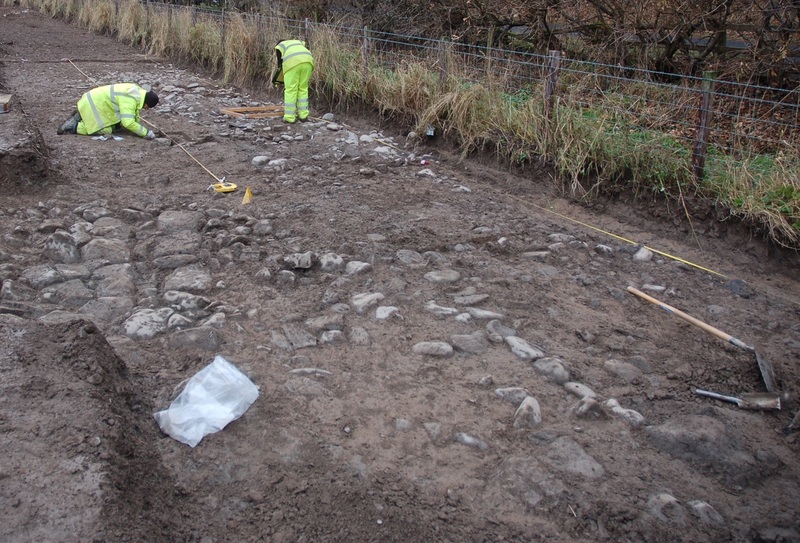 Over the winter of 2012 and 2013, the GUARD Archaeology team, led by Alan Hunter Blair, uncovered the foundations of stone built structures, cobbled farmyards and the foundations of walls, buildings and hearths. Amongst the artefacts recovered were two pivot stones, thought to have been used as hinges for the doors of the buildings. Given that the stones were found in a stone wall and as part of cobbling, it is likely that they derived from buildings that had been demolished and the stones re-used as rubble for subsequent structures at the site. The GUARD Archaeology team also recovered a variety of finds, which subsequent post-excavation analyses led by GUARD Archaeology Medieval Pottery Specialist Bob Will, revealed were of a predominantly domestic character. The artefacts included fragments of medieval pottery cooking vessels, jugs and mugs from Scotland, Germany and the Low Countries. 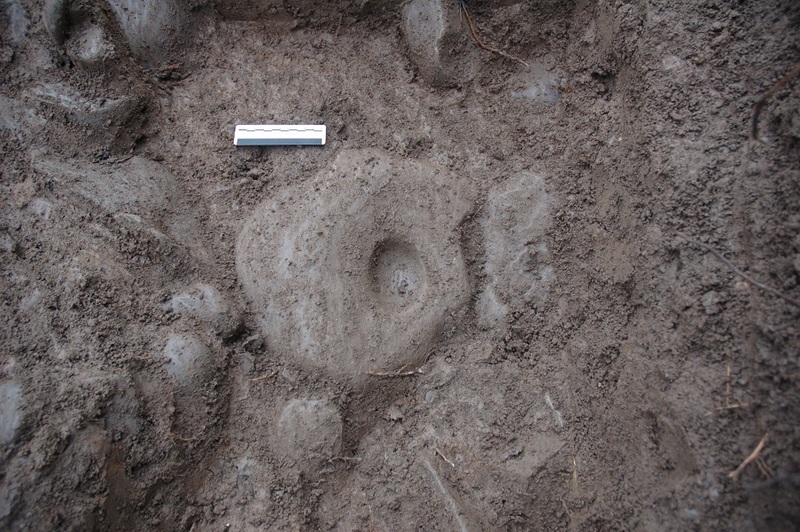 A decorated stone spindle whorl, which was used with a wooden spindle for the spinning of woollen thread, was also recovered. Other artefacts included stone counters, perhaps used for games, a rubbing stone used for wood or leather working and a whetstone, used for sharpening iron tools. Fired clay fragments were also found indicating the presence of ovens or wooden structures nearby. Although the bulk of the artefacts were recovered from the lower plough soil rather than sealed archaeological contexts they support a medieval date for occupation of this settlement, which was corroborated by charcoal from two hearths that yielded radiocarbon dates of cal AD 1472 -1645. None of the artefacts appeared to be connected to either the seventeenth century battle of Philiphaugh or the early medieval settlement apparent on aerial photographs, but they do suggest a later medieval settlement on the site dating from between the fourteenth and sixteenth centuries. As well as the post-excavation analyses of the artefacts recovered from the investigations, the archaeological excavations led to documentary research, by Dr Tom Turpie of the University of Stirling, into the history of the area, which revealed a number of references to tenants and dwellings at Philiphaugh in the sixteenth century and describes the ‘town’ of Philiphaugh in 1582 with a ‘tower, fortalice, manors, gardens, orchards and mills’. This suggests that there was a range of buildings probably spread over a large area along the river Tweed here, only a small sample of which was revealed by the new water pipeline. These references suggest that there were a number of tenants each with their own house, garden, outbuildings and fields, some of which had been sub-divided between families. The archaeological evidence would support these descriptions as the structural remains are located over a large area and suggest a dispersed linear settlement along the valley. The walls and extensive areas of cobbled surfaces indicate that the buildings were substantial and well made. The project demonstrated the archaeological benefits of limited small scale investigations where the main parties all work together. Consulting the Scottish Borders Council Archaeologist and Historic Scotland throughout the work, Scottish Water Solutions adapted their plans to avoid the most sensitive archaeological areas. The historical evidence demonstrates that houses and farms were known in this area but it does not identify their location, while the archaeological evidence can provide some indication of the location of structures. The site and surrounding area is well known for the Battle of Philiphaugh in 1645 but contemporary accounts refer to ditches, dikes and hedges that indicate field systems, but they do not mention houses or buildings, which could suggest that the farms or small holdings had been abandoned by that time. These investigations demonstrate that there was a thriving farming community in the immediate area, one that was ‘lost’ in the later farming improvements that restructured farms and fields. This work was funded by Scottish Water. The Scottish Borders Council Archaeologist and Historic Scotland provided advice during the course of this project. The full results of the archaeological discoveries, ARO11: Battle site and medieval settlement, the enigma of Yarrowford/Philiphaugh, Selkirk, is now freely available to download from Archaeology Reports Online (www.archaeologyreportsonline.com).